The Upper Keys of Florida provide tremendous opportunities to catch tarpon, bonefish, permit, redfish and snook. We have professionally guided these waters from more than 24 years and would love to show you this wonderful playground. Whether you are experienced at fly fishing or a first time angler, the Florida Keys provide the chance at a fish of lifetime. The Upper Keys including Islamorada, Tavernier, and Key Largo, are rich in heritage and tradition, so come looking for enjoyment, sunshine, and most important just relaxation. Remember its only fishing after all! Meet Captain Duane Baker: Florida Keys Flats Guide. As a Florida Keys fishing guide Duane provides sight casting and shallow water fishing in the Upper Florida Keys. He ranges from the backcountry of Florida Bay to the flats of Islamorada and Key Largo. Duane is an Orvis Endorsed Guide (Orvis has very high standards, and will only endorse some of the best) that offers full and half-day fly fishing and light tackle trips. He will guide you to tarpon, bonefish, permit, redfish and snook. 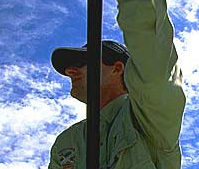 Duane has been guiding fly and light tackle anglers since 1988. His 24 years of professional guiding experience ensure that you are going to have the time of your life. Duane is one of those guides that are not happy till the angler is happy. He is patient and works tirelessly for each and every client. His list of return clients reads like a list of whose who of fly anglers however enjoys taking new clients to areas of the Keys they would otherwise miss. Duane’s reputation has made him one of the most popular guides in the Upper Keys and gained him high status with his peers. He is an Orvis endorsed guide and has been a member of Florida Keys Fishing Guide Association as long as he has been guiding. Known for very fast and very long first runs, this is probably the best-known species in Florida Keys flats fishing. There is a reason why they are called “gray ghost of the flats” and are a real light tackle challenge. Here in the Keys, bonefish generally average in the 6 to 8 pound range with fish of 10 to 12 or larger, not uncommon. They are usually fished in water less than two feet deep, and sometimes are seen so shallow that their tails and dorsal fins show as they root out food from the bottom. This is called “tailing” and is the most demanding of angler skills. Check out these pictures of happy clients with bonefish: bonefish pictures. The permit is a very strong and hard fighting fish, averaging 8 to 16 pounds. Fish in the 20 to 35 pound range are common with fish to near 50 pounds showing fairly often. They seem to tolerate slightly warmer conditions than bonefish, and are most productive from March thru September. Permit are usually found in waters less than 3 to 4 feet deep and will also float in channels or off flat edges in calm situations. They can often be the most challenging species to approach and hook with a subsequent battle that will leave you with a lasting memory. Take a look at these pictures of permit…more pictures will be added soon. The most distinguishing feature about the redfish is the deep bronze color and the black dot on the tail. Reds can be caught throughout most of the year, with the largest fish appearing in the late spring and staying through fall. Redfish reach maturity in their third year of life, by this time they should be about 27″ or longer. This is the point in their life when the larger fish will move offshore into the deeper waters to become breeders. Before this occurs they will stay in the shallow grass flats, mangrove banks and oyster bars, looking for an easy meal. Being primarily a crustacean eater you can imagine the smorgasbord of fare that is available to them…see the redfish image gallery. Although Duane prefers to guide anyone from beginners to experts, he and his tournament anglers are always in the top of the tournaments they enter. Limit of two anglers per trip. Note: you are required to purchase a $15 Park Entrance Pass. Booking multiple days with the Keys Flats Guide dramatically increases you opportunity to see, hook and land all of these great saltwater species. It allows for you to relax and enjoy the best restaurants in the Keys. Captain Duane Baker will meet you at a central location and provide you some of the best fishing available in the Keys. You can count on a great a trip – Daune is one of the best Key Largo & Islamorada fly fishing guides. Call 305-852-0102 to book a trip.